You are currently browsing the tag archive for the ‘managers’ tag. One of the things I really enjoy about my job are all the opportunities to participate in events and projects. In the last few years I have been on the Instruction Committee (creating policy around our computer classes for the public and laptop computer labs), blog committee (tech liaison etc), scheduling software committee (just wrapping up) and have helped coordinate a teen lock in/overnight, All Ages Art Night, Comixtravaganza, a regional gaming tournament and a reading marathon. That doesn’t include the regular programming I have done at my branches and outreach to my schools. I really love making my library a relevant and innovative space that is attractive to all ages. Now that things have settled down with some of my other projects, I am taking some new challenges. One thing that will take up much of my time is the formal mentoring program I entered into at work. I am trying to figure out if management is the right direction for me–to make sure that goal isn’t sticking with me just because it feels like that should be my next step. I love what I do, do I really need more? One of the things I want to work on during this time is critical reading and analysis of management and library topics. My mentor will assign me reading and I will pick something I find interesting and blog about it. Not here–I have set up another wordpress blog and will use that. I’ll update when I actually write something, probably in August sometime. The other thing I will do is job shadow and interview current managers and assistant managers to see what they do and how they balance life and work. In my own time, I also plan to submit a proposal for a presentation at WLA which is happening in Tulalip next April. It is a small conference, close to home and a good place to try out my public speaking. The worst thing about it is that I will probably know people there–bigger chance I’ll embarrass myself, right? It’s a chance I’ll take. My proposal entails building communities; how to make teen volunteers/teen advisory group ambassadors for the library and using programs to connect your library to the community. It wasn’t a misunderstanding. Only the alloted amount of programs will be allowed for the summer, so if I want to do my own, I have to forgo one of the others. This seems a little strange since the centrally funded programs don’t require any participation from me besides an introduction. I decided to keep the duct tape program and let the gaming program go. While gaming gets a bigger turn out, I don’t get to interact with the kids as much. Sitting down over duct tape and imparting my knowledge on how not to get all your fingers stuck together is a great opportunity to get to know more of the teens in my neighborhood. I am disappointed in this decision. It makes me feel like this great new strategic plan is just a front. A placater for our library board. It takes away our decision making powers and leaves us feeling like cogs in a machine; don’t deviate from the path or the whole thing might fall apart. This is the second time my manager has approved something, only to have to come back and say no. That must be frustrating to her as well. Sigh. What am I reading? I stayed up late finishing The Luxe last night and it ended just as I thought. The author threw in a few doubts along the way, but I basically knew what was going to happen from the prologue. Otherwise, it is a good book with lots of detail from the time and the characters, while not fully formed, are complex and compelling. Not everyone is likable and even the main “perfect” character has flaws (which is a plus in my mind). 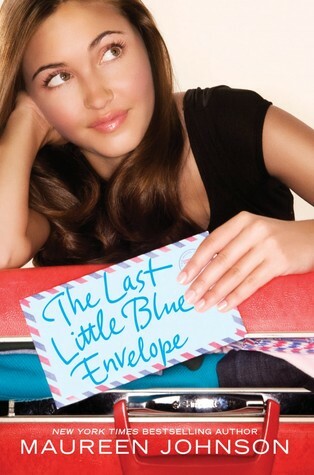 I am definitely enjoying The Last Little Blue Envelope by Maureen Johnson, even if it did start a bit too conveniently. I think the set up could have been more in the background to avoid that. However, Maureen has a knack for making her characters well rounded and interesting, as well as taking us to another part of the world in unbelievable circumstances and making them believable. If this one started a bit rough, it recovered quickly. It’s not very often that I get to combine two of my loves, books and cycling. Except when I ride to work, I suppose, but one might argue that work, while book related, is not always a “love”. But now I have a real reason to get excited. Bike Snob is coming to Seattle during the Seattle Bike Expo for what he calls a BRA–book related appearance. Bike Snob is the kind of blogger who cannot offend me, despite all his attempts. He has a masterful grasp of sarcasm and satire and constantly makes me laugh. I have read his blog faithfully since I stumbled upon it last year. Unfortunately, I have not yet read his book. Guess I’d better get crackin’. Or even better, I can buy a copy there and get it signed. Maybe I was just looking for the right moment. In libraryland we are planning Summer Reading programs–or I should say we just got done. There always seems to be some controversy over interpretation of policy in these situations. We were told we could have 3 system generated programs–things planned by our programming coordinator and paid for through central programming funds–which we would schedule with the performers. The directions also said that any branch generated programs would have to be paid for and supported by the branch. This would lead one to believe that those programs are possible, yes? Some took that as a no. So now we are fighting to have our couple of branch programs as well, where we librarians have ownership and get to interact with our patrons. I will say that my manager was one who interpreted the policy the way I did and I am sure this is all a minor misunderstanding. All I want is a duct tape program! It won’t even cost anything because we already have kits ready. What am I reading? I think I have too many things on my plate right now. 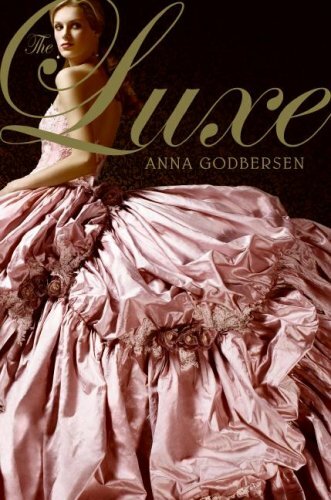 I have set aside No God but God and picked up The Luxe by Anna Godbersen, which is interesting historical fiction from around1900. Right now it is seriously too predictable, but I am enjoying that the author has included both the rich elite of New York and the lives of their servants. Usually a book will settle on one or the other, with the other half in the peripheral. It is a bit like Gossip Girl during the horse and buggy days, with all the intrigue and backstabbing that you expect. I have picked up two galleys I am excited about; Girl Wonder by Alexa Martin and The Last Little Blue Envelope by Maureen Johnson (I loved the first book in this series). And I finished reading The Kneebone Boy by Ellen Potter. Three siblings have lost their mother under mysterious circumstances, and it has affected them in many ways. Their father goes away a few times a year and leaves them with an abhorrent neighbor, until one time late in the school year when he decides they can go visit their aunt Angela in London instead. It turns out there is a misunderstanding and Aunt Angela is away on a trip, leaving the kids stranded and alone. This is the leaping off point for all kinds of adventure. And isn’t the cover great? Lots of fun things planned in Libraryland. My new manager is great and I am seeing her a lot more. We had our one on one yesterday and we discussed programs and outreach. I am going to add one gaming program a month (mostly table games) starting in March. TAG is going to work on a video project and we discussed ways of making a neighborhood scavenger hunt work. The problem being, how do we send the teens out into the world without having to worry they will be hit by a bus or get lost? Has anyone else done one of these? What did you do? My assistant and I are planning a Facebook class for the semi computer literate and to revamp our email class once again. We have had a lot of requests for the former and the later is giving us problems. We changed our email class a while back because people were showing up for the wrong class-(email 1 is for beginners, email 2 is for those more advanced)-often people would show up for email 2 having never had an email account. We combined the classes, but have found that it is too much to cover in one class and that we were still spending a lot of time on those needing to sign up for email accounts. This time we are going to concentrate on email 1 and build in an extra half hour at the beginning for acquiring email accounts. What am I reading? Still Penelopiad by Margaret Atwood, but I also finished the first omnibus of Girl Genius by Phil Foglio, Kaja Foglio. I really like this comic, with it’s complicated plot and smart girl hero. It is a steampunk comic (created before steampunk became such a cult craze) with dirigibles and something called spark, where those that possess it can make mechs that move on their own. Agatha has always thought she was just a bad mechanic with big ideas. Everything she made malfunctioned and wreaked havoc. One day, on her way to class, her broach was stolen and everything changed. Agatha is a strong female character, she knows who she is (well, mostly), what she wants and she isn’t going to let others push her around or make up her mind for her. And just as I say I am not going to try any harder, I got a twitter account. I decided if my library system could finally bite the bullet, so could I. I did sign up a while back for about a week before it all became too much information and I shut it back down. I suppose I’ll add a link here when I get around to posting something. Right now, I am trying to get a hang on what all the @ and # and acronyms mean. I am not learning this as quickly as I usually do, probably because of the large amount of information that can be packed into 100’s of 140 character tweets. I might need a tutor. Luckily I seem to have a lot of friends on there. I am encouraged with how things are going in Libraryland. My new manager is fantastic, when I get to see her. Her response time to email is a bit slow, but I am guessing that has to do with all her moving around. She is in charge of 4 branches and I have only seen her twice since the beginning of January. However, my concerns about expanding teen programming at my branch have been allayed and I am very hopeful that I will be able to have another regular monthly program along with a few add ins. Teen Tech Week is coming up and I am hoping to host a Scratch program. Our system participated in trying out this program along with a few others around the US. “Scratch is a programming language that makes it easy to create your own interactive stories, animations, games, music, and art — and share your creations on the web.” I have tried it out a couple of times and it is a lot of fun and it is easy to create some really cool simple video games and animation videos. This one is pretty cute, for example (I didn’t see a way to embed the project). As for a second monthly program (the first being TAG), I am thinking about simple gaming. I would bring a Wii and we would have table games and snacks. Just for Teens, although we also talked about having a quarterly all ages gaming day as well. I have to talk more about that with my children’s librarian. For future stand alone programs, I was thinking about a Teach an Adult day, where we could have the computer lab and the video games set up and the TAG members could teach adults how to use Facebook and other technologies. With me as their fearless leader, of course. It would be a lot like a day at the reference desk. Jacob Reckless lost his father to the mirror years before he learned to follow him to the land beyond, and now he has lost his brother as well. Will is being taken away before his eyes, a slow casualty of a war they know little about. The dark fairy has given the Goyl, a race of stone people who are embroiled in a war with humans, the power to turn any human they harm into one of them and Will was injured by one. Jacob must save him before the stone takes over. There is love and longing, magic and adventure, all of it dark and brooding. I think it would be scary for anyone under 12. The references to fairy tales is distracting from the story–the unexplained premise being that the magical items that Jacob hunts for and some of the characters and circumstances in the alternate world explain Grimm’s fairy tales. I think a little more introduction to this would have helped. There are also some parts where the translation is choppy (from the German) which could have been fixed with a little more editing. Otherwise this book is enchanting and engaging. Definitely worth the read. Ahhh, leaving tomorrow for camping. I am going to drive slowly along highway 2 and just breath. Speaking of breathing, I am feeling like a hypochondriac. I had some allergies, as I do every year (sore throat, congestion). Did some work with the netti pot and they got better. However, I still have a cough occasionally, my back/ribs ache, I am more tired than I should be and it reminds me of when my dad had pneumonia last year but didn’t know it until he went to the doctor. I get little flash fevers and headaches too, but I am not sure… Ah well. If I still have these things when I get back from soaking in the eastern Washington sun, then I will make an appointment. It seems weird that I could be as active as I am and have pneumonia, but then Dad rides even more than me. My youngest brother came over this week and finished the beer making process with me. We moved the beer into a bottling bucket, then added the priming sugar and bottled. The color was nice and I think using a bottling bucket will lessen the amount of sediment we’ve had in previous batches. There were certainly a lot of yeast turds left at the bottom of the first bucket. It was a beautiful day and the landlords brought us some lovely watermelon. We sat out in the yard eating huge wedges of watermelon and soaking up the rays. It was a nice end to a good day. My teen advisory group is going forward. My manager is really excited about it and I am starting to get excited too. I know I should have been earlier, but I was so ready to be shot down again, I didn’t want to get my hopes up. I am going to start a soft promotion next week when I visit the local community centers. I have been seriously missing the Mister this week. He is so far away and I have slowed down on all of my social activities. I filled up my date book with friend dates and outings the first few weeks, then went to Boston, and I didn’t have time to miss him. This week I have been home most nights, reading or watching Doctor Who or Bollywood movies. My couch is lonely, my room is lonely, my kitty is lonely. But I also like being home rather than busy all the time, so I guess I had just better deal. What am I reading? Mainspring by Jay Lake. I like it! It reminds me of a cross between Leviathan and Bloody Jack. I haven’t seen any reason why it is in adult rather than teen yet, but that may still be coming. It is a bit slower than most teen books, but the protagonist is a young adult that goes on an adventure to fill a quest given to him by an angel. Sounds YA to me. In Libraryland: I stopped in my branch today to pick up my holds. I got my official letter that states my transfer, and that is about all it said. Not even whether I was still a TSL (teen services librarian, for those of you out of the library lingo loop), but my manager assured me that I still am. I feel somewhat guilty that I am pretty much ok with my assignment. Many of my coworkers are getting moved to places that do not fit their lives well. Mine is a little further from home, definitely harder to get to traffic, bus and bike-wise, but also has some very good qualities–busy branch, lots of kids and teens, lots of reference. We still don’t know where managers will land, so I don’t know who mine will be and that could make or break the deal. There are several that I would love to have and several I would rather not and a whole slew in the middle that I don’t really know from adam. What am I reading? Still LeFreak–I am reading a bit slower than usual. Not that I want to set you up for lightning fast updates… but the holidays makes me spend my free time crocheting and baking, rather than reading. Back to the book. I still think this girl is crazy, but I can now see her as a real person and as one who is hiding from her past by being super busy, super popular and super geeky. She is on the internet, plugged into her iPod, getting and sending text messages 24/7. This girl needs a chill pill. I am posting now, because I know the next couple of days are going to be busy, and I am just not sure I will have time to be on the internets. I hope everyone enjoys their NYE!